Call 1-800-745-3000 to purchase tickets via Ticketmaster or select a venue below to purchase online. Additional service charges may apply. Located in front of N. entrance of Pan Am. Visa, MasterCard, Discover, American Express, Aggie Cash and cash accepted. Visa, MasterCard, Discover, American Express, and cash accepted at all Ticketmaster Outlets. Please keep your purchased tickets secured. 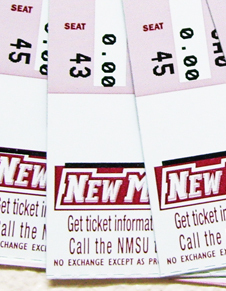 New Mexico State University venues will not replace lost, stolen, or damaged tickets. If tickets were originally purchased via the Ticketmaster Web site or by Ticketmaster Phone, then customer should call Ticketmaster at 1-800-745-3000 to request a refund. If tickets were originally purchased at the Pan American Center Ticket Office, then customer will need to return tickets to the Pan American Center Ticket Office for a refund. If tickets were purchased at an alternate Ticketmaster outlet (UTEP Ticket Center, etc. ), then customer needs to return to that same Ticketmaster outlet to request a refund. The Pan American Center Ticket Office cannot guarantee the validity of tickets purchased through any entity other than the Pan American Center Ticket Office and Ticketmaster. To avoid problems with counterfeit, stolen or inflated-priced tickets, purchase them directly and only from the Pan American Center Ticket Office, authorized Ticketmaster outlets or Ticketmaster.com. A child age 3 and under does not require a ticket but must sit on the lap of the accompanying adult.